This review of the Motovox 2 wheel gas scooter, the MVS10, is being done by a person that actually bought one not too long ago from Kmart. Those that know me very well know that I love almost anything motorized. When I saw this thing at the store, I knew it was something my kids would love to ride on and have fun. I own so many four wheelers, mini bikes, and scooters already, that it seemed like a good item to add to the collection in my garage. In this article review, I will go over some of the things I like about the Motovox 2 wheel gas scooter, and some of the things I don’t like. I will do my best to help you out as you try to determine if you should purchase one. These things are pretty cheap compared to many others. I paid just a little bit under 400 dollars for mine at Kmart, but now that they have some stores going out of business, you might be able to buy one for a lot less at one of the stores that will be closing soon. For a brand new gas powered scooter, this is a very reasonable price to pay. I have to suspect that if you look around a little, you could do a little better on price and maybe get one for just under 300 dollars, give or take a little. The Motovox MVS10 certainly isn’t very expensive. It looks great. The styling is pretty cool and it got instant approval from my children who shuffled to be the first one in line to ride it. You can plainly see that it is built relatively well for something in this price range. I am impressed by the aluminum handlebars especially, something most companies use a low grade steel for. These are thick and well made. My first impressions were very good, and this review will be pretty good as well. Coming right out of the box, there is very little that needs to be done before you can get out and ride, which is something that I really liked. With many off brand scooters and four wheelers, there is a fair amount of assembly required. This is not the case with the Motovox MVS10 and is a real benefit to consumers looking for a cheap gas powered scooter. Did They Lie About Performance? In each and every motorized item you buy, you tend to find at least one or two things that were puffed on the sales copy. None of my off brand four wheelers purchased over the years approached the speeds claimed on their websites. This is common. In the list below, I will go over the main areas of performance, as well as what is claimed on the site. 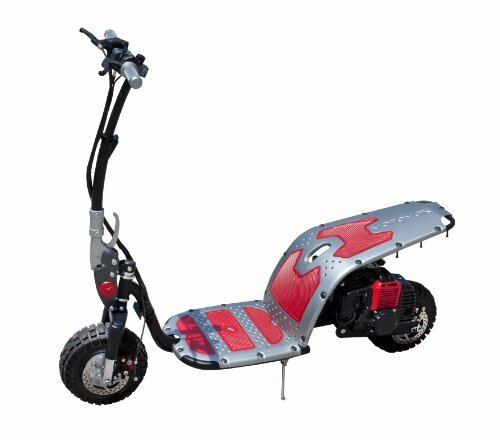 Top Speed: It is claimed that 160 pound riders will get about 19mph out of their Motovox gas powered 2 wheel scooters. This is actually a little high, as one of my sons weighs in at 155 pounds. The top speed we get is right around 17mph, which is much faster than it sounds when riding something like this. Now, I cannot say they are telling a fib because on a perfectly flat surface, I would assume we could get that extra 2mph out of the machine. Power: It isn’t overly powerful, but with a 43cc engine, you cannot expect it to have tons of torque. Still, for what it is, if you have realistic expectations, you will most likely be pretty pleased with what it can do. Takeoff speeds are moderate at best, but again, it is a small engine. Do not expect to scale large, steep hills without a push from the foot as you really start to climb up. Gas Consumption: I have not tested it under precise methods to find if it gets 30 miles per fill of the 1/3 gallon gas tank. This works out to be about 90 miles per gallon. I suspect this is a little high, but not too far off. After riding the scooter for about 15 miles on the trails, the tank looked to be just a little under half full. I suspect 70 plus miles per gallon is a realistic expectation. This is pretty good fuel efficiency for any gas powered scooter. The Motovox MVS10 delivers very close to what it promises. I would say that in all areas, the claims are closer to accurate than that of any other scooter or four wheeler I have owned. Initial Setup: The website walks you through the process. All you have to do is put on the handlebars and add a little grease to the gearbox. The website does a good job of showing you how to do this. If you have very limited skills with this type of stuff, you will probably still be just fine in doing it yourself. 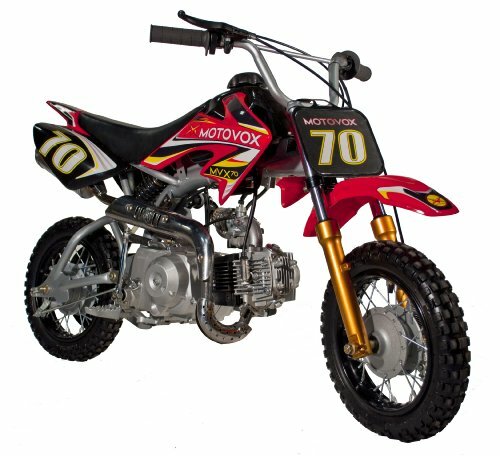 Website: The Motovox website does a fantastic job of walking you through a pre-run checklist, the minimal initial setup required, and servicing your unit. You will find they even have help for fixing flat tires, adjusting the idle properly, brake adjustment and carburetor service. This is a feature many other gas powered scooters manufacturers are lacking. In my opinion, this is a sign of a company that is going to show a commitment to customer service and satisfaction. There is a good chance the Motovox company will be around for a long time and the review will be favorable. Yes. I am impressed with the quality and have virtually no complaints at all. I don’t know what the future will bring, but so far, I would say it was worth every penny of the cheap price. I hope you have enjoyed my reviews of the Motovox 2 wheel scooter called the MVS10. Thanks for the comment. Are you sure you're getting that much speed out of it? I only ask because people generally over estimate speed. Oh, but thanks for the tip on adjusting the fuel mixture on my Motovox scooter.